Staying focused during a two-hour-plus concert of classical music can feel like a real workout for most people – and something that can be a barrier to attending. 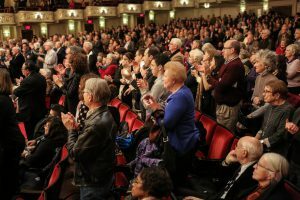 The New York Times chief classical music critic Anthony Tommasini has observed that the rigor of classical concerts prevents more people from going to the symphony. “That live classical music requires concertgoers to listen and focus, often for lengthy stretches, has long seemed off-putting to many potential aficionados,” he wrote in 2015. But even for newcomers, classical music may have an added benefit beyond the art – toning up sagging attention spans and flabby focus! Read more at Quartz.com – The classical music concert is a vital workout for our sagging, flabby attention spans. Want to give your attention span a workout? Check out the 2017-2018 season of the Pittsburgh Symphony Orchestra’s BNY Mellon Grand Classics series – single tickets start at only $20 and subscriptions begin with six-concert packages.